Freerider Luggie Elite folding travel scooter comes with the same features as the Standard Luggie, but now it offers a larger 16.5" seat, bigger 10.5ah lithium battery pack, seat with armrests standard and a retractable handlebar. The Luggie Elite features an LED Battery indicator, an auto retractable bumper and a better weight capacity of 350 lbs. 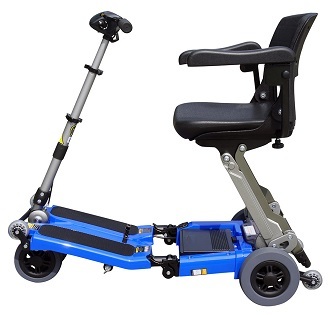 It is the newest Generation travel scooter for the Active Seniors. Folded scooter conveniently rolls along like a suitcase! Note: Every color of the Luggie Elite comes with FREE armrests. Standard seating Foldable, compact, vinyl-covered molded plastic. * Varies with user weight, terrain type, battery charge, battery condition, and tire condition. 3 Years Structural Frame: Luggie Scooter, Freerider Healthcare warranties the frame of its Mobility Scooters under normal use for a period of 3 Years (36 months). 1 Year Motor, Transaxle, Brake Assembly, Electrical Components: Luggie Scooter, Inc., Freerider Healthcare warranties the Motor/Transaxle/Brake and Electronics of the Mobility Scooters, under normal use for a period of 1 Year (12 months). 1 Year Lithium Batteries: Luggie Scooter, Inc., Freerider Healthcare warranties the lithium batteries of the Mobility Scooters, under normal use for the period of 1 Year (12 month). 30 Days Limited Warranty on All Plastic Parts: Luggie Scooter Inc., Freerider Healthcare warranties all plastic parts (Tiller Clamp, Chassis Hooks, Trigger, Tiller Lever, etc., Excluding all electrical parts and the motor ) of the Mobility Scooters, under normal use for a period of 30 days.